The ear can be tricked by ambiguous sounds, just as the eye can be fooled by optical illusions. Sound reflection, whisper galleries, reverberation, ricochets, and interference patterns were perceived in the past as eerie sounds attributed to invisible echo spirits, thunder gods, ghosts, and sound-absorbing bodies. 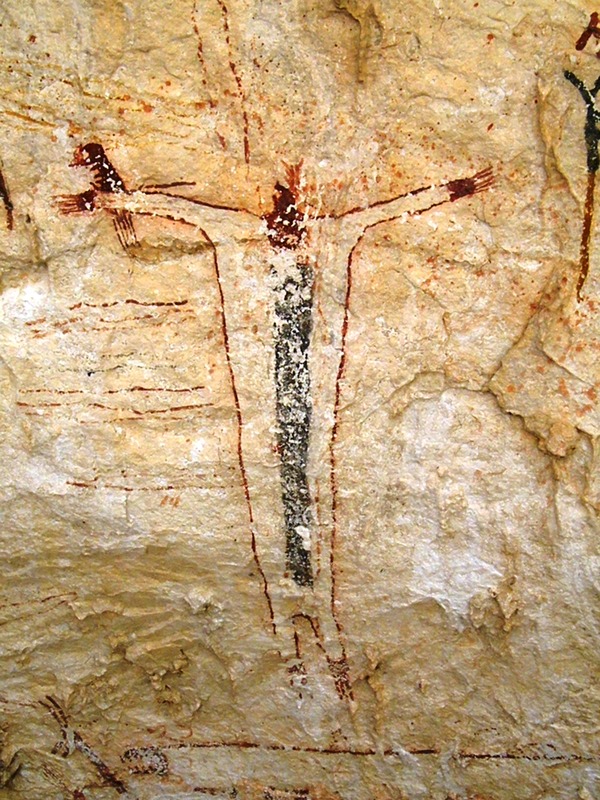 These beliefs in the supernatural were recorded in ancient myths, and expressed in tangible archaeological evidence as canyon petroglyphs, cave paintings, and megalithic stone circles including Stonehenge. Controlled experiments demonstrate that certain ambiguous sounds cause blindfolded listeners to believe in the presence of phantom objects. Figure 1. 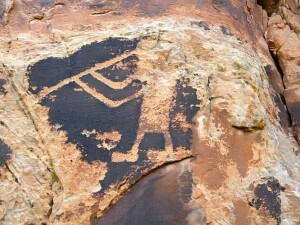 This prehistoric pictograph of a ghostly figure in Utah’s Horseshoe Canyon will answer you back. 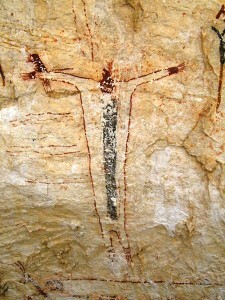 Voices coming out of solid rock gave our ancestors the impression of echo spirits calling out from the rocks. Just as light reflection in a mirror gives an illusion of yourself duplicated as a virtual image, sound waves reflecting off a surface are mathematically identical to sound waves emanating from a virtual sound source behind a reflecting plane such as a large cliff face. This can result in an auditory illusion of somebody answering you from deep within the rock. It struck me that canyon petroglyphs might have been made in response to hearing echoes and believing that the echo spirits dwelt in rocky places. Ancient myths contain descriptions of echo spirits that match prehistoric petroglyphs, including witches that hide in sheep bellies and snakeskins. My acoustic measurements have shown that the artists chose to place their art precisely where they could hear the strongest echoes. Listen to an echo at a rock art site in the Grand Canyon (click here). Figure 2. This figure on the Pecos River in Texas is painted in a shallow shelter with interesting acoustics. Just as light reflected in a concave mirror can focus to give a “real image” floating in front of the surface, a shallow rock shelter can focus sound waves like a parabolic dish. Sounds from unseen sources miles away can be focused to result in an auditory illusion of disembodied voices coming from thin air right next to you. 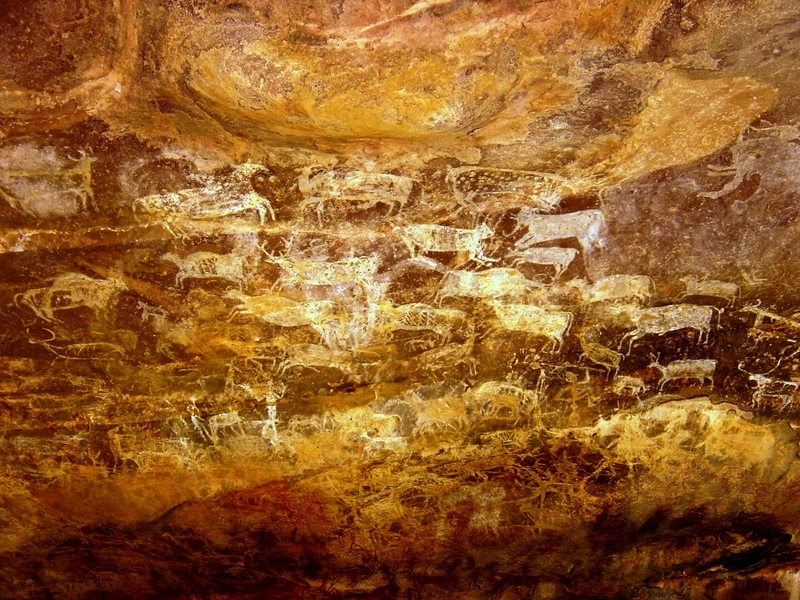 Such rock shelters were often considered places of power, and were decorated with mysterious paintings. These shelters can also act like loud-speakers to broadcast sounds outward, such that listeners at great distances would wonder why they could not see who was making the sounds. Figure 3. 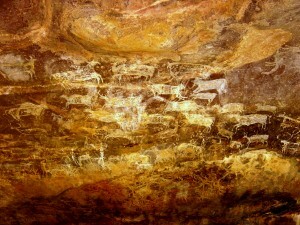 This stampede of hoofed animals is painted in a cave with thunderous reverberation in central India. Echoes of percussion noises can sound like hoof beats. Multiple echoes of a simple clap in a cavern blur together into thunderous reverberation, which mimics the sound of the thundering herds of stampeding hoofed animals painted in prehistoric caves. Ancient myths describe thunder as the hoof beats of supernatural gods. I realized that the reverberation in caves must have given the auditory illusion of being thunder, and thus inspired the cave paintings depicting that the same mythical hoofed thunder gods causing thunder in the sky also cause thunder in the underworld. Listen to thunderous reverberation of a percussion sound in a prehistoric cave in France (click here). Can you hear the ricochet reminiscent of a ghostly “Boo” in this recording of a clap in a highly reverberant room? Figure 4. A petroglyph of a flute player in an echoing location within Dinosaur National Monument. Figure 5. An interference pattern from two sound sources such as bagpipes can cause the auditory illusion that the silent zones are acoustic shadows from a megalithic stone circle, and vice versa. Mysterious silent zones in an empty field can give the impression of a ring of large phantom objects casting acoustic shadows. Two sound sources, such as bagpipes playing the same tone, can produce an interference pattern. Zones of silence radiating outward occur where the high pressure of sound waves from one source cancel out the low pressure of sound waves from the other source. 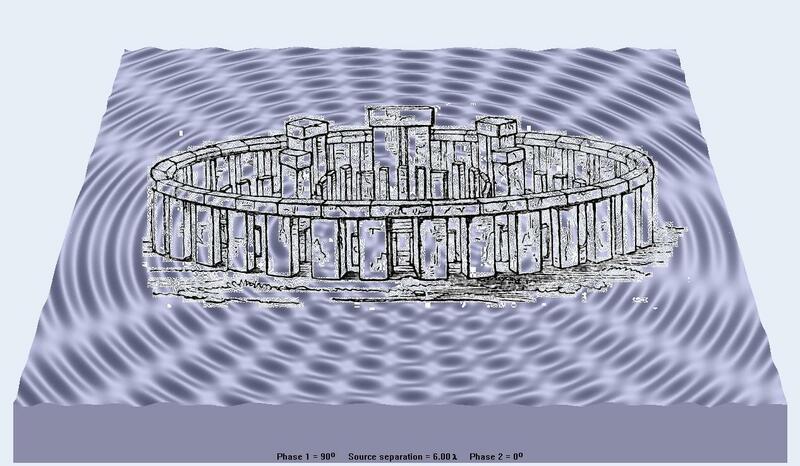 Blindfolded participants hearing an interference pattern in controlled experiments attributed the dead zones to the presence of acoustic obstructions in an arrangement reminiscent of Stonehenge. Figure 6. Drawing by participant C. Fuller after hearing interference pattern blindfolded, as envisioned from above (shown on left), and in perspective from ground level (shown on right). I then visited the U.K. and made measurements of the actual acoustic shadows radiating out from Stonehenge and other megalithic stone circles, and demonstrated that the pattern of alternating loud and quiet zones recreates a dual source sound wave interference pattern. 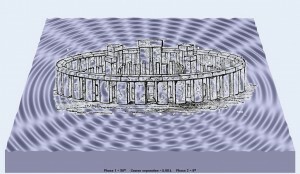 My theory that musical interference patterns served as blueprints for megalithic stone circles – many of which are named “Pipers’ Stones” — is supported by ancient legends that two magic pipers enticed maidens to dance in a circle and they all turned to stone. Listen for yourself to the similarity between sound wave interference as I walk around two flutes in an empty field (click here), and acoustic shadows as I walk around a megalithic Pipers’ Stone circle (click here); both have similar modulations between loud and quiet. How would you have explained this if you couldn’t see what was “blocking” the sound? Complex behaviors of sound such as reflection and interference (which scientists today explain by sound wave theory and dismiss as acoustical artifacts) can experimentally give rise to psychoacoustic misperceptions in which such unseen sonic phenomena are attributed to the invisible/supernatural. The significance of this research is that it can help explain the motivation for some of mankind’s most mysterious behaviors and greatest artistic achievements. There are several implications and applications of my research. It shows that acoustical phenomena were culturally significant to ancient peoples, leading to the immediate conclusion that the natural soundscapes of archaeological sites should be preserved in their natural state for further study and greater appreciation. It demonstrates that even today sensory input can be used to manipulate perception, and can give spooky illusions inconsistent with scientific reality, which could have interesting practical applications for virtual reality and special effects in entertainment media. A key point to learn from my research is that objectivity is questionable, since a given set of data can be used to support multiple conclusions. For example, an echo can be used as “proof” for either an echo spirit or sound wave reflection. Also, just based on their interpretation of sounds heard in an empty field, people can be made to believe there is a ring a huge rocks taller than themselves. The history of humanity is full of misinterpretations, such as the visual illusion that the sun propels itself across the sky above the flat earth. Sound, being invisible with complex properties, can lead to auditory illusions of the supernatural. This leads to the more general question, what other perceptional illusions are we currently living under due to other phenomena that we are currently misinterpreting? See https://sites.google.com/site/rockartacoustics/ for further detail.